Explanation: Created as planet Earth sweeps through dusty debris from mysterious, asteroid-like, 3200 Phaethon, the annual Geminid Meteor Shower should be the best meteor shower of the year. 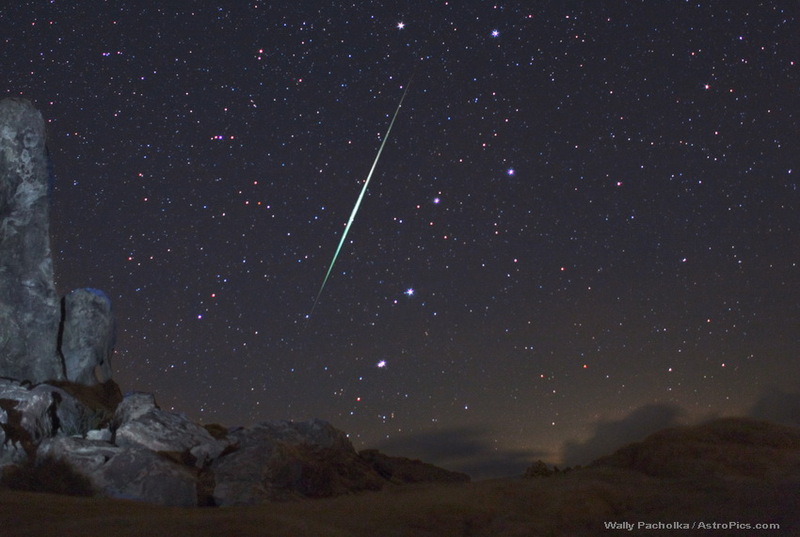 The Geminids are predicted to peak on the night of December 13/14, but you can start watching for Geminid meteors this weekend. The best viewing is after midnight in a dark, moonless sky, with the shower's radiant constellation Gemini well above the horizon - a situation that favors skygazers in the northern hemisphere. In this picture from the 2009 Geminid shower, a bright meteor with a greenish tinge flashes through the sky over the Mojave Desert near Barstow, California, USA. Recognizable in the background are bright stars in the northern asterism known as the Big Dipper, framing the meteor streak.